In Estonia, doctors urge local politicians to deny themselves alcohol during public arrangements to struggle against drunkenness. In Russia, authorities are not ready to give up consuming heating drinks. The tradition to drink alcohol for any kind of success (from winning elections to passing bills) and to celebrate all the holidays of the calendar is too deep-rooted in Russia. According to old-timers of the State Duma, offices of many deputies turn into real banquet halls. One can buy alcohol to any taste at the shops of the Lower House of the Russian Parliament. In addition, deputies’ friends and supporters traditionally present them with bottles of alcohol on any occasion. On the eve of holidays long lines of people with big oblong boxes can be seen in the building of the State Duma. Deputies themselves tried to solve the problem, but they failed. Andrei Vulf put forward a suggestion to stop drinking alcohol in the parliament. But his counterparts were not very enthusiastic about it. Vladimir Zhirinovsky, the leader of the Liberal and Democratic Party of Russia (LDPR) supported the initiative of dry law in the parliament. But according to the Duma frequenters, it was the LDPR faction to organize clamorous tablefuls. Formerly, at Soviet party bequests they used to drink only vodka. Now it is different. According to analysts of the alcohol market, the consumption of strong alcohol decreased in Russia, whereas the consumption of soft drinks – beer and wine – increased. Moreover, because of higher incomes most Russians start drinking expensive alcohol, experts say. The political elite follow this trend as well. A new generation of politicians has come to power in Russia. Young ministers and deputies as well as businessmen go in for swimming, skiing and playing tennis. They have an example to follow. 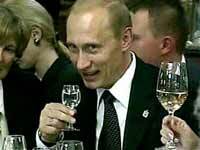 Vladimir Putin drinks nothing but beer, which he took liking to in Germany. Before he became the president, he used to empty his glasses into flowerpots on the sly. President-elect Dmitry Medvedev is going to continue the tradition. The would-be head of state prefers mineral water, although he can drink a glass of white wine. Viktor Ilyukhin, a senior official at the Russian Parliament, does not agree that a positive example of senior officials will show a positive influence on the political elite. “No positive personal example can eliminate the aftermath of eight years of hard drinking under Yeltsin,” he claimed. “Now the situation in the Duma has worsened.” The official believes that Russia needs a special law to forbid officials to drink at work. CEO of the Center for Political Information, Alexei Mukhin, says that the favourite drink in the Duma is whisky, and cognac in ministries. Ladies of politics do not differ much from ordinary women. They prefer champagne and wine both in the government and in the Parliament. Politicians do not drink vodka and beer, for these drinks are too cheap and simple. According to experts, politicians of older generation prefer vodka. So does the Gennady Zuganov, the leader of the Communist Party of Russia. He says he drinks moderately, three glasses at most. Many other old-timers of the parliament and the government confess drinking vodka as well. “I never drink whisky, if I drink anything, it is vodka,” said Gennady Raikov, a member of Russia’s Central Election Committee. Irina Khahamada prefers a glass of red wine. Deputy Duma speaker Lyubov Sliska likes champagne, while Anatoly Chubais, the head of Russia’s energy monopoly Unified Energy Systems, likes lager beer better. Grigory Yavlinsky combines patriotism and Westernism – he drinks Stolichnaya vodka and Johnnie Walker whisky. Viktor Chernomyrdin developed a taste for the Ukrainian vodka known as horilka when he worked in Ukraine. Apart from Chubais, only Vladimir Putin admits drinking beer. Most foreign politicians prefer beer. US former president Bill Clinton went on a trip in Prague alehouses, degusted many sorts of beer there and was very pleased with the excursion. Germany’s former chancellor Gerhard Schroeder finds pleasure in drinking beer and in singing songs about it. George Bush prefers Coca-Cola to all alcoholic drinks, because he used to consume a lot of strong drinks when he was younger.